For the record...Rudy was offsides. And the whole laying jerseys on Devine's desk protest thing...yeah, that never happened. The interior Michigan OL looked good but not great against CMU. Things will be much tougher against Notre Dame's big and talented front 3...easily the best unit on the Irish defense. Louis Nix is a beast, although he does get jumpy from time to time. The 340+ pound nose tackle can disrupt running lanes and eat centers for breakfast. But if you can get bodies on him, once Gardner or Fitz or Green or whoever gets around him, he's out of the play. He's quite slow in the open field. Defensive end Stephon Tuitt is the real deal. Plain and simple. Taylor, you have your orders. Notre Dame misses Manti Te'o. Not only was he the best defender ND had, but he was also the leader of the defense. In the 2Q last week, Temple was able to adjust and start to move the ball pretty well. Temple QB Connor Reilly, who was a baseball player in the spring, looked pretty comfortable finding receivers and scrambling for 10+ yards when he had to. No way Temple moves the ball that well on the Irish a year ago. The Owls just had trouble once they hit the redzone. Michigan however doesn't seem to have that problem. Last week Michigan was 7 for 7 in the redzone with 6 TDs. In November last year, with Devin at QB, Michigan was 13 for 13 in the redzone with 12 touchdowns. So they key to victory? Get to the redzone, apparently. If Temple had a decent kicker, the they could've made it a game...maybe. When Michigan needs to throw...throw out routes. Quick out routes all day long. That, plus Dileo/Norfleet underneath and Funchess all over should give Devin all the targets he needs. But they key is mixing it up to keep ND off balance. They blitzed quite a bit against Temple, and with quite a bit of success. So of course, I'm beating the offensive line drum because that's what you do in a game like this. You win in the trenches, plain and simple. Tommy Rees is still a quarterback at Notre Dame. The senior has been given the keys to the offense this year as this is the first time he's began a season as the starter thanks to Everett Golson's ineligibility for 2013. A week ago against Temple, Rees looked good tallying 346 yards and 3 TDs. Much of that can be attributed to the porous Temple secondary as all of those yards were garnered from just 16 competitions. But if given time, Rees can be effective. He has a strong arm and can just hang in the pocket until he spots a receiver. I think the effectiveness of pressure by Michigan's front 4 is going to be huge. I'm not worried at all about Rees scrambling. Notre Dame runs a spread-ish offense, but Rees is not a mobile QB like Golson. The ND offensive line is decent but struggled as the game went on. Against a constantly rotating Michigan defensive front, this could be a big issue for the Irish offense. Another issue for Notre Dame will be Michigan's linebackers. Morgan, Gordon and Ross will need to be everywhere on Saturday. Notre Dame's feature RB Amir Carlisle only carried the ball 7 times for 68 yards and no scores. I'm not sure how much of an impact he and Cam McDaniel (12 carries for 65 yards) will have in this game. It seems to me that Rees must carry this offense. TJ Jones is Tommy's favorite target at the slot. His ability to get into space in the middle of the field might cause Michigan problems, but that brings me back to the linebacker emphasis. Chris Brown, maybe the fastest player on the squad is a talented wideout. Tempo-wise, Notre Dame moves quickly, as you would expect a Brian Kelly offense to do. But they're not warp-speed. Against Temple, Notre Dame started fast with two scores in the first 4 minutes, but then struggled to move the ball consistently throughout the rest of the game. Part of that was Rees not playing as sharp, another (and bigger) part was the offensive line struggling against a mediocre Temple front 4. Expect Kelly to do some different things on offense, maybe a trick play or two...maybe a fake punt early. I doubt Kelly wants to play as conservative as he did a year ago. It wouldn't be a marquee game without a custom wallpaper from the best wallpaper shop in town. Saturday night, the 114,000 or so folks in the stands will be given maize pompoms, as per usual. And also these blue blinky wristbandy things. Wojo. BTN's Tom Dienhart previews week 2 around the B1G. Michigan great Ty Law calls into BTN Live to discuss UM-ND (video). ESPN's Mel Kiper Jr. and Todd McShay break down the NFL talent that will take the field Saturday night. Rittenberg breaks down the game (video). Nick Baumgardner from MLive 5 Keys. Fee Fi Fo Film by MGoBlog's Ace. Maize & Brew does a Q&A with Irish blog One Foot Down. MVictors goes way back to 1887 to discuss how and why M Men taught up some Irish students about this funny thing called football. Previews from UMGoBlog, Touch the Banner. • The men's basketball team is going to be honored on the field for their Final Four run last season. Trey Burke and Tim Hardaway Jr will be in attendance. Just as long as they show The Shot on the jumbotron, that's all I ask. • After the national anthem, there will be a fly over by the Black Diamond Jet Team. • Tom Harmon will receive full Michigan Legend honors with a pregame ceremony and an announcement of who will wear the #98 jersey. This will be really cool. Michigan has every ability to control this game. Temple kept Notre Dame's defense off-balance for most of the first half by doing things Michigan is more than capable of doing. It's cliche, but like I said earlier, this game will be won in the trenches. If Michigan can control the line of scrimmage and run the ball effectively, they can win going away. I don't see Rees having an entire game of success against this Michigan defense. He'll get some passes here and there and hit some receivers/TEs. But I don't see ND's OL doing anything great against Michigan's defensive front. The Irish need to be able to run the ball, and that could be a problem. 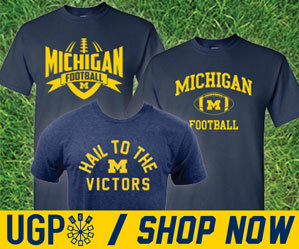 For Michigan, keys to victory are 1) Pound the football. Between Fitz and Derrick Green, there's more than enough talent and ability running the ball. 2) Give Devin time to make plays, which means keep Nix/Tuitt out of the backfield at all costs. 3) Linebackers must show up to play, both in coverage and blitzing. Linebackers can win this game for Michigan.